Our background is in events and nightclubs. 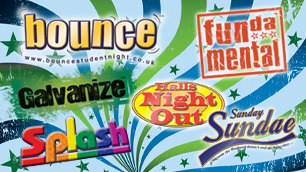 For over twenty years we have promoted and operated large scale weekly club nights and have created and developed a range of club brands for this. This included all imagery from flyers to adverts to club branding. Most nights were aimed at the student market but also had a wider appeal to the local market too. From 'bounce' which is our mainstream student night brand through to Galvanize our indie brand and Splash which is our gay club night. We will be looking to use these brands for promotional nights for our website brands, particularly Key to the City™ Students. They will also feature within our websites and are available for use as brands for a weekly club night in any city in the UK or beyond. We also have twenty years worth of experience and contacts in the nightclub business. From djs to live artists, designers to peripheral entertainment, we have built up a large and trusted network.